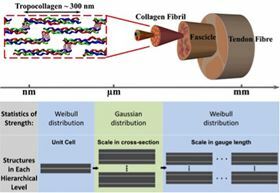 (Top) The hierarchical structures of tendon, a biological material known for its high strength and toughness. (Bottom) Transition of the statistics of strength during material scaling up at each level in a composite with nested hierarchical structures. Natural materials like nacre shell, collagen, and spider silk possess an exceptional combination of strength and toughness thanks to a bricks-and-mortar-like structure. During synthesis, whether by a mollusk or on a production line, defects occur by chance and accumulate in the material as it grows, which adversely affect its final mechanical properties. Natural materials show a remarkable ability to withstand these defects – or so-called ‘size effects’ – and preserve their characteristics from the micro- to the macroscale. Now researchers at Northwestern University have come up with a mathematical model that describes – and can predict – the outstanding mechanical behavior of natural composites [Wei, et al., Acta Biomaterialia (2015), http://dx.doi.org/10.1016/j.actbio.2015.01.040]. The staggered arrangement of strong, stiff filaments embedded in a softer matrix seen in natural materials seems, over multiple hierarchical levels, to cancel out the size effect and render their strength insensitive to scale. The new statistical ‘shear lag’ model reveals that there is a critical length scale at which the dominant failure mechanism switches from filament fracture to sliding at the interface between the two composite constituents, says Horacio D. Espinosa who led the work. Interestingly, the critical length scale found by the researchers using the new model coincides with a fundamental length observed in the statistical models of fiber-reinforced composites many years ago, explains Xiaoding Wei. Another unique finding emerging from the work is that the statistics describing the strength of hierarchical composites change from a type of distribution know as a Weibull distribution to Gaussian and back to Weibull at each level during material scale up. The new model provides a much deeper understanding of the structure-property relationships in natural biomaterials and the hierarchical composites inspired by them. Using the model to introduce defects in a controlled manner enables defect tolerance to be designed into a material and size effects to be suppressed. “This finding provides valuable insights for the design of novel bio-inspired high-performance composite materials,” explains Espinosa. The model highlights the importance of controlling material microstructure during fabrication – something that is now possible using modern synthesis techniques such as three-dimensional printing. Combined with the results of nanoscale experimental analysis, the researchers will now use the model to design novel high-performance composites. “We are planning to use our theory to guide bio-inspired composites design of, for instance, graphene oxide-based nanocomposites,” Espinosa tells Materials Today. Log in or register to download this article for free.